Flossing is basically no one’s favorite activity. But some oral health professionals would argue that it’s even more important than brushing your teeth. If it’s that important, then the stakes are pretty high. Flossing is a non-negotiable for healthy teeth in the long run. Unfortunately, flossing becomes both more difficult and more important when braces are in the picture. All the brackets and wires have a tendency to trap food particles close to the teeth and speed up the decay rate, so even though your teeth are harder to get to, they actually need the attention more. What this means is that, while you have braces, you will probably need to spend about three times the amount of time taking care of your teeth as you need to before or after braces. In this post, we want to give you a couple of time and teeth-saving tips to help you out. While we highly recommended brushing your teeth after every meal when you have braces, you only need to floss once a day. Figure out whether flossing works best as part of your morning or evening routine, and make sure you keep this habit consistent. Choose the right floss! We recommend waxed floss, and you’ll likely find that one of the flat, tape-like single-fiber types of floss works best with your braces and keeps little pieces from shredding off and getting stuck on the brackets. Experiment with a water flosser or a different brush. To be honest, special brushes like proxy brushes or orthodontic brushes can be helpful tools for braces care, but they shouldn’t be used as a substitute for manual flossing. Even a water flosser (which is quite useful and effective), still doesn’t reach certain places. We recommend trying out some of these products in addition to flossing – not as a replacement for flossing. 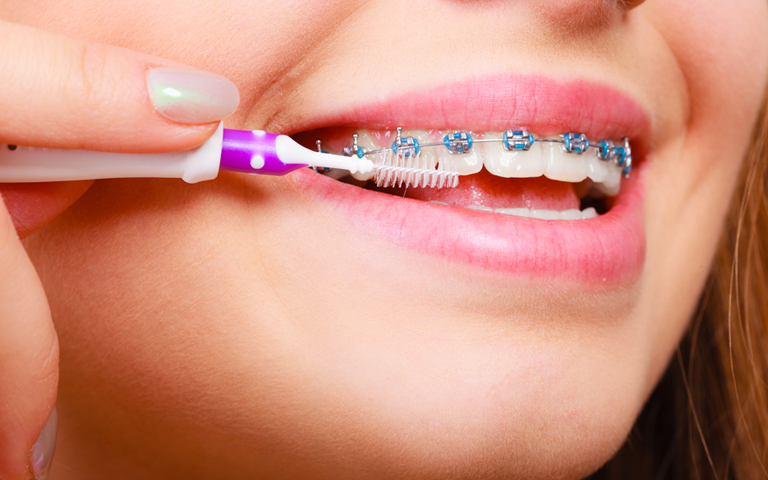 Braces can be kinda high maintenance, but the finished product will be totally worth it. Don’t skip out on the flossing. You’ll be glad you didn’t.